Lahore, like many Pakistani cities, is struggling with a trend towards car-centric development that has resulted in intense traffic congestion and air pollution. Photo by Luke X. Martin/Flickr. Lahore, Pakistan is on a dangerous path toward a future of urban highways, underpasses, and flyovers that will eventually suffocate the city. By prioritizing car-centric infrastructure through new development contracts, the city is making traffic congestion, air pollution, and road safety—already major challenges—worse. Infrastructure projects are important triggers for economic development. However, it’s important to question whether Lahore really needs more valuable urban land dedicated to cars. In a city where 40 percent of total trips are taken by foot and only 8 percent by private car, should infrastructure spending really prioritize car owners? Increasing road capacity is not a sustainable solution to tackling traffic congestion. In fact, it adds more demand for vehicular travel, eventually resulting in more congestion and emissions. The logic is simple: more lanes on Lahore’s roads will increase the demand for travel, leading to additional car purchases and resulting in heightened traffic congestion. Although many cities worldwide have attempted to alleviate traffic congestion by increasing the road space available to cars, most of them are now exploring ways to mitigate the economic and environmental damage caused by car dependence. In many cities—like New York City in the 1960s and San Francisco in the late 1950s—community led movements were able to mobilize the public to prevent neighborhood destruction and urban highway development. In other cities—like Seoul and Bogotá—urban highways had to be torn down at a huge cost many decades later. The lesson is clear: we need to avoid the mistakes of the past and invest in the right types of infrastructure today. The sparse pedestrian infrastructure that exists in Lahore today has been ineffective. Planners have considered pedestrian bridges a reasonable response to the needs of those traveling by foot. However, these pedestrian bridges have frequently proved inaccessible and inconvenient to most pedestrians and commuters. These bridges have encouraged jaywalking, generated additional safety concerns for pedestrians, and created hazards for cars passing underneath, which often have to swerve to avoid hitting jaywalkers. The lack of understanding reflects poorly on the city’s urban planners and reveals a strong class bias in infrastructure planning. Whether intentional or not, it seems like Lahore is currently being planned for the automobile, and not for people. Transport infrastructure projects should always serve city residents equitably, especially when projects are funded by public money. Projects that benefit a wealthy few are an extreme form of regressive spending, and—when coupled with regressive tax laws—effectively redistribute resources from the poor to the wealthy. Even a cursory look at the transport infrastructure in Pakistani cities shows that local governments have continually focused primarily on building roads, addressing the mobility needs of a few car owners while ignoring the needs of many low-income residents. Metro bus projects in Lahore and Islamabad are a step in the right direction, but they only scratch the surface. Lahore, with a population of over 10 million, has a single bus rapid transit (BRT) corridor stretching 27 kilometers, whereas Ahmedabad, a city with less than half of Lahore’s population, has twelve corridors spanning over 85 kilometers and plans to develop five new corridors. Enrique Peñalosa, former mayor of Bogotá, Colombia, has been a prominent advocate of using road space in a more equitable and efficient way. He’s even hailed BRT buses zooming past cars stuck in traffic as “democracy at work.” But if Lahore’s road space does not equitably meet the needs of public transport users, it does even less for bicyclists, who account for 5 percent of trips according to the city’s urban transport master plan. 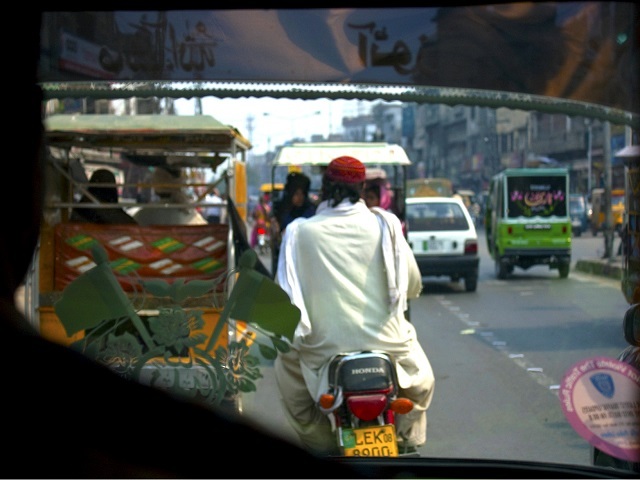 Bicyclists and pedestrians put together make up almost 45 percent of all trips in Lahore, but they get next to nothing when it comes to transport infrastructure and investment. The time is now to curtail the growth of unchecked suburbanization and urban sprawl. By undertaking a comprehensive review of current zoning and land use patterns, city leaders can properly plan for dense, mixed-use development—an effective strategy to reducing commuting distances and overall travel demand. Creating a comprehensive public transport network takes time. But in the short-term, it’s not hard to improve connectivity around BRT stations by providing feeder buses, more park and ride facilities, and integrating the right kinds of pedestrian and bicycle infrastructure. Additionally, city leaders should consider congestion pricing and parking fees to manage traffic congestion in the city, and to pay for the true economic and social cost of car dependency. Small interventions like this can go a long way in protecting vulnerable populations, encouraging non-motorized transport, reducing traffic congestion, and making the city a more vibrant place.